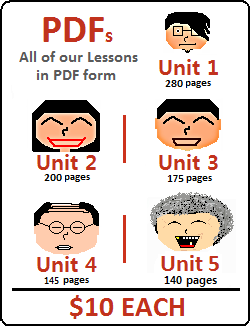 A PDF file neatly presenting all of these words, example sentences and extra information can be found here. Want to give your brain practice at recognizing these words? Try finding the words in this vocabulary list in a Word Search. This grammar is taught in Lesson 113. 영어를 어떻게 배웠어요? = How did you learn English? 홍대역에서 어떻게 가요? = How do I get to Hong-dae station? 전철역까지 걸어갈래요? = Shall we walk to the subway station? This refers to the bus stop for a public transportation style city bus. For inter-city buses, the word “버스 터미널” (bus terminal) is more frequently used. The word “와이프” is commonly used these days. 어머님은 너에게 돈을 줬어? = Did your mother give you money? 얼마나 많은 돈을 가져갈 거야? = How much money will you bring? 친구들은 언제 올 거예요? = When are the friends coming? 캐나다에 언제 돌아올 거예요? = When are you coming back to Canada? 선생님 몇 분 올 거예요? = How many teachers will come? The grammar for this is talked about in Lesson 14. 알다 follows the ㄹ irregular. See Lesson 7 for more information. 제가 한국어를 왜 배우고 싶은지 알아요? = Do you know why I want to learn Korean? 걷다 follows the ㄷ irregular. See Lesson 7 for more information. 한국어를 언제부터 배웠어요? = Since when did you learn Korean? 무슨 생각 해? = What are you thinking? 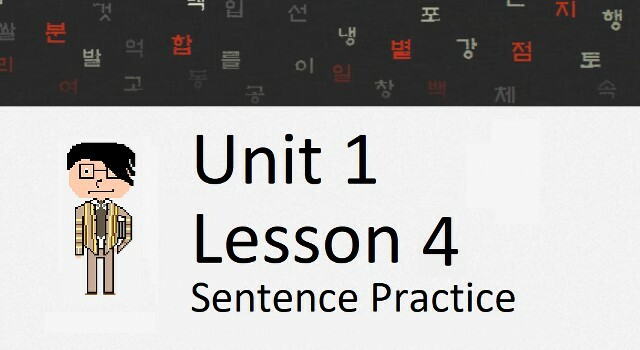 Typically the grammatical principle ~ㄴ/다고 precedes 생각하다 as if it is a quoted sentence. For more information, visit Lesson 52. 우리 집에 대해 어떻게 생각해요? = What do you think about our house? 살다 follows the ㄹ irregular. See Lesson 7 for more information. Notes: In order to say that you live in a place, it is acceptable to use “살고 있다.” For example: 저는 한국에서 살고 있어요. Note that this directly translates to “I am living in Korea”, whereas is English we would most likely say “I live in Korea.” See Lesson 18. 한국에서 언제부터 살았어요? = Since when have you lived in Korea? This is the first passive verb you have come across. 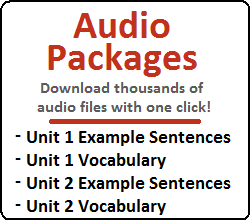 For more information on passive verbs, visit Lesson 14. 이 콘서트가 벌써 끝났어요? = Is the concert already finished? Notes: A composition of the adverb 잘 (well) and the verb 생기다 (to look like), which means it gets conjugated as a verb. It typically conjugates to the past tense (잘생겼다) even when talking about the present tense. 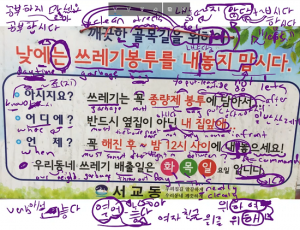 Notes: A composition of the adverb 못 (not well, poorly) and the verb 생기다. Like잘생기다, it is conjugated as a verb in the past tense. 다르다 follows the 르 irregular. See Lesson 7 for more information. Notes: When saying something is different “from” something, 와/과/랑/이랑 must be attached to the noun that is being compared. See Lesson 15 for more information. 슬프다 follows the ㅡ irregular. See Lesson 7 for more information. Like the word “맛있다,” 재미있다 is made up of “재미” and “있다” (to have). Therefore, even though 재미있다 is an adjective (funny), it is conjugated like 있다. Notes: An adjective that means “many,” 많다 can be placed before a noun to describe it, for example: 많은 사람은 저를 좋아해요 (many people like me). However, 많다 is more naturally used by using the ~는 것 principle. For example: 저를 좋아하는 사람은 많아요 (literally: there are many people who like me). The ~는 것 principle is very difficult to describe, and is talked about which is very difficult to describe, and is talked about in detail from Lessons 26 to 33. 그 회사에서 일하는 사람은 많아요 = There are many people who work at that company. 거기서 언제부터 살았어요? = Since when did you live there? 저기요! 지금 주문할게요! = Excuse me! We would like to order now! 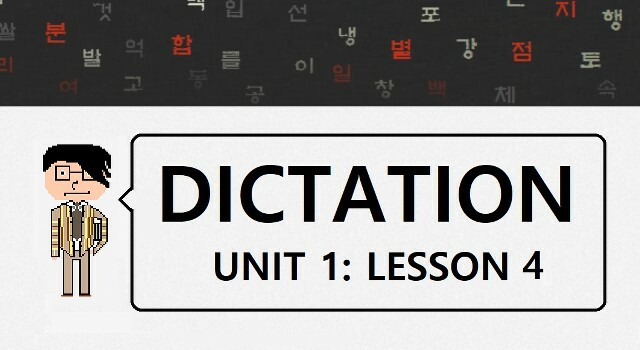 Notes: It would be more natural to connect sentences with a grammatical principle (like ~지만 or ~는데) than to separate them using 하지만. 어디에서 왔어요? = Where are you from? If you can’t memorize them, that is okay. I still maintain the position that you should put off memorizing these until you can understand the grammar within them. Now that we have gotten that out of the way, let’s start studying some actual material. 나는 크다 배를 원하다 = Not correct. Not by a long shot. Most of the time, when you deal with a verb/adjective, you eliminate ~다 and add something to the stem. you must eliminate ‘~다’ and add ~ㄴ or ~은 to the stem of the adjective. The verb “to eat” predicates this sentence. The verb “to like” predicates this sentence. The adjective “to be delicious” predicates this sentence. Notice that there is no object in this sentence. (Remember, for the last time – you do not know how to conjugate verbs and adjectives at the end of a sentence yet. This will be introduced in the next lesson. Because you do not know how to conjugate verbs/adjectives at the ends of sentences, examples with un-conjugated forms are presented in this lesson. 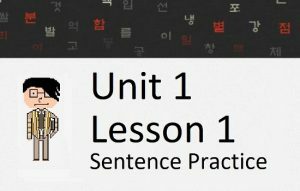 Remember that these sentences are technically incorrect, but understanding them is crucial to your understanding of the Korean sentence structure. However, I didn’t say anything about adjectives and objects being used in the same sentence. Adjectives can be used to describe an object that is being predicated by a verb. I will continue to talk about this in the examples below. The verb “to go” predicates this sentence. The adjective “to be small” predicates this sentence. Notice that there is no object in this sentence. The verb “to want” predicates this sentence. The adjective “to be big” predicates this sentence. Notice that there is no object in this sentence. However, this is very complex and is the whole basis to the ~는 것 principle that I mentioned earlier. As I said, you will begin to learn about this in Lesson 26. You are still very far from understanding how complex sentences like that work, but I want to show you that the content you learned in this lesson brings you one step closer. Also notice that the particles 이/가 are attached to the subjects in sentences ending with “많다.” There are some words where the use of the particles ~이/가 on the subject of the sentence is more natural than the use of ~는/은. 많다 is one of these words. We will continue to tell you in which situations it is more natural to use ~이/가 instead of ~은/는 as we progress through our lessons. Make sure you notice the difference between the previous two examples. In English these two are written the same, but sound different when speaking. In the first example, you are emphasizing that YOU also speak Korean, in addition to other people that you are talking about. In the second example, you are emphasizing that (in addition to other languages), you also speak Korean.